Presenting Anna #2 Girl of Nightmares by Kendare Blake. Begins where 'Anna Dressed in Blood' left off. 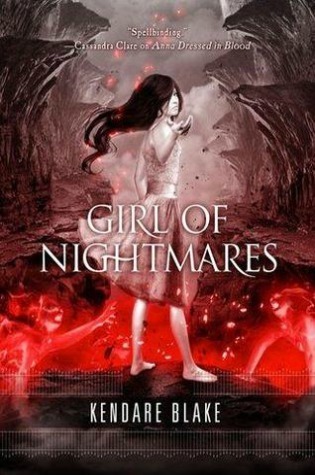 And must say 'Girl of Nightmares' is a change of pace. Wherein the first book, Anna Korlov throughly spooked us with her vicious after life tendencies, at the end saving Cas and his friends lives against the Obeman..... And don't forget the effort Cas put in catching her.... it was definitely the perfect Halloween read..... But what progressed was the point that never sits well with me..... the romance between a ghost and a living being. Still Girl of Nightmares was a change of pace purely because Cas is not hunting ghosts this time but answers.He knows Anna is in hell or wherever the knife sends them but so is the Obeman and he wants to get her out of there. While the change of pace puts the spook factor to a lower degree but what I liked of this book was that we found out more about Cas' history or more probably on that of the knife and just how dangerous it actually was. Kendare Blake presents a much subdued and calm finale to her ghostly saga..... but worry not you will find all the ghosts, secret societies and action you desire out of this book. "An intense unraveling and action-packed finale"